Global N-hexyl Alcohol Market size was estimated over USD 1.1 billion in 2016 and will exhibit growth more than 4% up to 2024. Rapidly growing personal care industry in the Asia Pacific will have significant impact on the overall N-hexyl alcohol market size in the coming years. This is mainly due to rising awareness towards personal health, hygiene and care particularly in China, India, Japan, Malaysia and South Korea which has significantly propelled demand for shampoos, soap, hand wash, lotions, perfumes, etc. According to the U.S. Department of Commerce Estimates, the per capita cosmetic spending in China. was USD 24 in 2014, whereas in Singapore, it was USD 90 and in Japan it was USD 174. Product finds widespread applications in producing packaging material, for instance polyvinyl chloride (PVC) which is used for wrapping cosmetic and personal care items including lotions, creams, shampoos, etc. Additionally, it is extensively used for manufacturing fragrance agent, mainly perfumes in the personal care industry. Furthermore, it is also used as an inert ingredient in the preparation of several skin care products. The aforementioned trends will make substantial contribution to the global N-hexanol market size over the forecast timeframe. Strong growth in the pharmaceutical industry mainly in North America is likely to make noteworthy contribution to the N-hexanol market size over the forecast spell. According to The International Federation of Pharmaceutical Manufacturers & Associations (IFPMA), North America constituted approximately 40% of the overall pharmaceutical sales in 2016. Product is broadly used as a chemical intermediate in the formation of several medicines, for instance, actomyosin adenosine triphosphatease. Additionally, it is widely used in the production of hypnotics and antiseptics. Moreover, it is used as an odor agent in the preparation of lotions and ointments. The product also finds wide-ranging applications in the pharmaceutical packaging industry for wrapping material including medicines, capsules, tubes, vials, bottles, etc. which will help make prominent contribution to N-hexanol market size in the coming years. Availability of several product substitutes in the market, for example, N-decanol, N-octanol, N-undecanol, N-nonanol, etc. is likely to obstruct the N-hexyl alcohol market size in the coming years. These products also find application as plasticizer precursor, chemical intermediate, lubricant additive, odor agent, etc. across food & beverage, personal care and pharmaceutical industry. For instance, n-octanol, which is also colorless and a slightly viscous liquid, is used as chemical intermediate, plasticizer, odor agent and fuel additive. N-hexyl alcohol market size for plasticizer precursor is projected to rise at a CAGR of more than 4% during the forecast timeframe. This is mainly attributed to wide-ranging product use in producing wrapping material across several end-user industries including pharmaceutical, food & beverage and personal care industry. Product is mainly used in producing PVC based packaging material which is used in wrapping vials, bottles, medicines, etc. in pharmaceutical industry and cosmetics such as lotions, creams shampoo, etc. in personal care industry. Rising aforementioned industries will make substantial contribution to the N-hexanol market size over the forecast time period. For instance, the overall retail sales of personal care industry were valued over USD 465 billion in 2015 which is likely to grow significantly in the coming years which in turn will have positive impact on the N-hexyl alcohol market size during the forecast timeframe. N-hexanol market size for chemical constituted more than 30% of the industry share in 2016. This is due to wide-ranging product applications. For instance, it is used as a plasticizer precursor, chemical intermediate, inert ingredient, odor agent, lubricant additive, etc. in the chemical industry. As a lubricant additive, it is used to improve the overall performance of the base oil. Furthermore, its application as inert ingredient is in the form of emulsifiers, solvents, carriers, propellants, dyes, etc. Moreover, it is used as a chemical intermediate in preparation of variety of solvents, solid separation agents, surface active agents, adhesive and sealants chemicals, etc. which will help make significant contribution to N-hexanol market size during the forecast period. Asia Pacific N-hexyl alcohol market is the fastest growing and is anticipated to rise at a CAGR close to 4.5% in the forecast timeframe. Sturdy growth in personal care, pharmaceutical and food & beverage industry in the region mainly due to rising socio-economic factor, will make valuable contribution to N-hexanol market size in the coming years. According to the U.S. Department of Commerce, per capita cosmetics spending in the Asian countries witnessed an exponential rise in last 5 years. The region also observes trends such as: emergence of a young urban population, organized retail, increased westernization of FMCG markets and the rapidly booming e-commerce market. Additionally, rising packaged food industry will further propel the product demand in direct food contact applications including: polymer films, food wraps, etc. which will help attain significant gains to N-hexanol market size in the coming years. 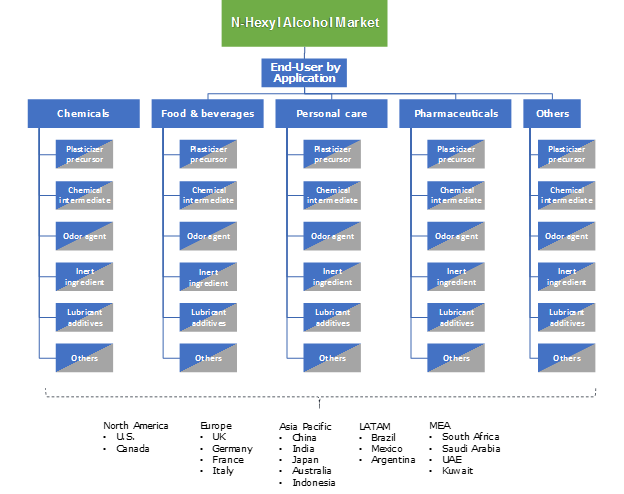 The N-hexyl alcohol market is highly fragmented, with the major manufacturers accounting for over 35% of the overall market share in 2016. The major players include Sasol, Nanjing Chemical Material, Alfa Aesar, Haihang Industry, Yancheng Hongtai Bioengineering, Simagchem Corporation, Merck, Ecogreen Oleochemicals and Penta International. Most of the major players are engaged in attaining competitive advantage over its competitors by expanding their production capacities. For instance, Sasol commenced the construction of its novel alkoxylation plant in Nanjing, Jiangsu in 2017, which is likely to be operational in 2019. This new unit will help modernize and expand company’s current alkoxylation capacity and strengthen its position in China. Rising product demand across personal care, pharmaceutical and food & beverage industry mainly in the Asia Pacific is likely to make noteworthy contribution to the overall N-hexanol market size in the coming years. This is mainly due to product use as plasticizer, chemical intermediate, lubricant additive, etc. across aforementioned industries which will help make significant contribution to the business size during the forecast timeframe. Furthermore, strong product demand across pharmaceutical and personal care industry in North America due to rising R&D investment to help develop variety of drugs, cosmetic products, etc. will make valuable contribution to N-hexanol market size over the forecast timeframe.